As you have seen in the page about proportions, the size of the feet is important for the appeal of your bear, if you have any doubts, make the larger than having them too small. According to the size and character - of course a baby bear would have small feet - teddy's feet should be large enough to stand on them. 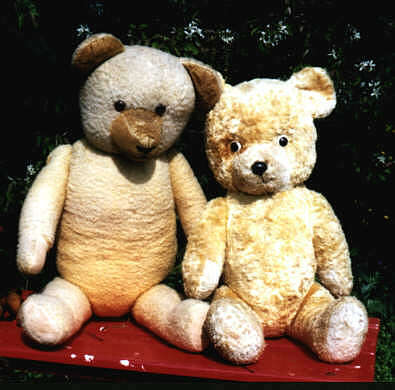 Very short feet as cheap teddy bears often had because of the lower costs always look a bit multilated - exspecially combined with too short arms. Extreme large feet - this is Ebbo by Annette Weis - a feature appearing in the last years and of course a matter of taste. When you design very large feet be sure the ankle will be strong enough, otherwise the teddy legs will bend while standing. 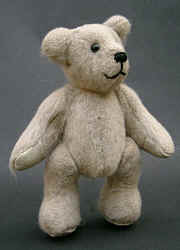 Even small bears - this one is 5" tall - should have feet long enough and never too thick. These look like the feet of an elephant rather than a teddy's. The picture right shows how the feet would look longer and flatter. 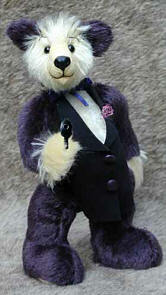 Many bears are able to stand without help, because they have specially weighted feet, for example filled with glass pellets, as Rita Harwood's James Bond. 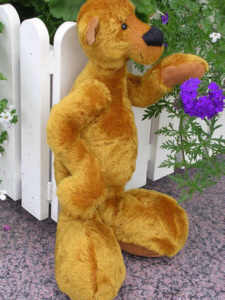 If your bear will stand rather than sit down, you should design his feet not only long, but also broad. Like my grandpa some bears have very large feet with cardboard inlays, so they can stand upright. 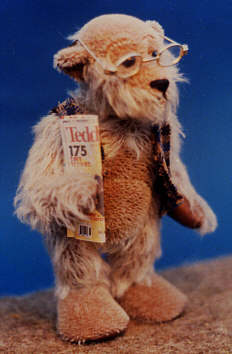 His feet are made of short piled mohair and don't have a center seam , this way they are more flat than usual. 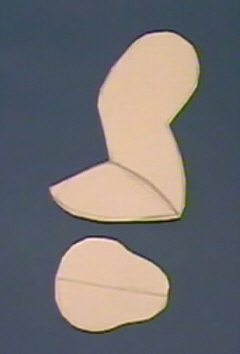 When I designed the legs, I separated the foot piece (left). At the upper edge I made a fold ( middle ). 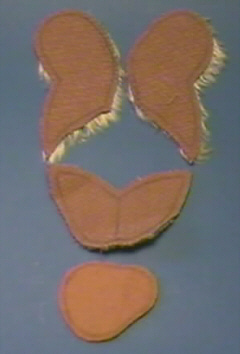 The sole inlay were cut from thick cardboard using the sole pattern but slightly smaller (right). It can be glued inside the foot, but it also works if it remains loose. For constructing the soles keep in mind that the half of the circumference will be as long as the length of your foot pattern. If you want to design your feet symmetrical, it is enough to draw only the half side of the sole on to a folded paper. After cutting you get the whole pattern. You can use a measuring tape, but I found it is much easier to cut a piece of wire in the length you need and bend it the way you want, as you can use it as a curved ruler then. Many times I don't measure but draw the footpad right under the leg pattern using my imagination (a). If your bear should get wide feet, mind that the foot can become broad enough. 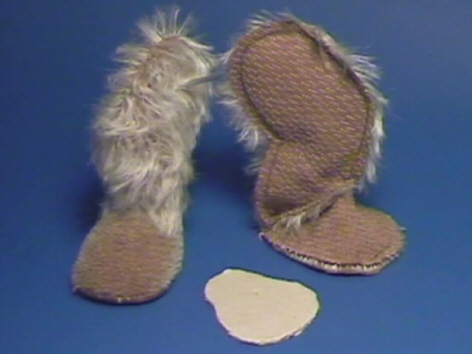 If the foot is too narrow, the sole will turn outside and you will see the footpads from the side. 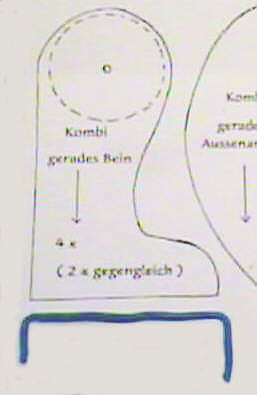 (b) The foot should be thick enough (c). 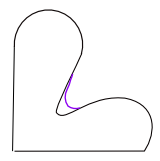 You also can design a curved line (c), to fit in the foot pads. 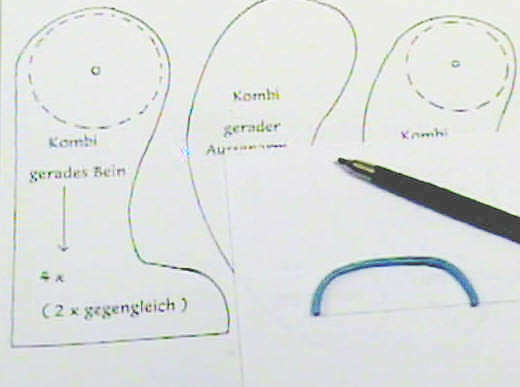 How non symmetrical Soles - for example those bith a big toe - can be designed will be shown in the next page.